3.19 How do we create a performance improvement system in our organization? How do we create a performance improvement system in our organization? 5. Connect to the budget. 6. Make it useful (especially to managers). (6) Make it useful to managers: If it is useful to managers, it will meet the needs of top management, the budget, the legislature or county council. And the data will be better. (7) Pay attention to data quality and timeliness: This means investing in data development and data systems. (8) Insist on a few “headline” measures for each component of the department/agency: Do not allow people to use too much data, to overwhelm the system; to lose the forest for the trees. (9) Live by a simple rule: If it’s not useful, don’t do it. 3.5 Where do we start in an organization that wants to do this? 3.6 Where do we start in an organization that doesn’t want to do this? Where do we start in a community) that wants to do this? 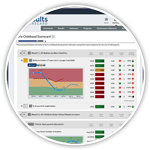 Clear Impact Scorecard software to easily build capacity and support RBA implementations. Over 45,000 copies sold! 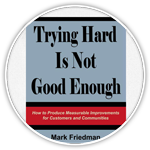 How to produce measurable improvements for customers and communities. 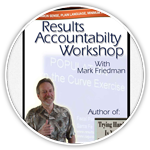 This video workshop by Mark Friedman introduces the Results-Based Accountability™ framework.